The terms crenellated and castellated are sometimes used synonymously when applied to the rims of glassware (Newman 1977, p. 80). Both terms have architectural connotations, with similarities to designs found at the top of parapets (battlements). The following images will give the reader some idea as to the variety of rim forms that can loosely be described as trefoils. They are found on English and Irish cut glass made during the period c1790-1810. These examples are from Palmer 1993 (pp. 230, 231, and 238 respectively. The first image shows a rim that is a simplified version of the above drawing. In the second image the central lobe of the trefoil has been divided into two sections. 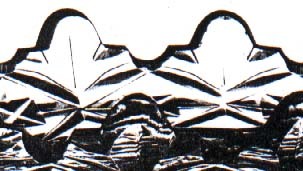 The third example has a considerably modified trefoil rim. The following, last example is an especially fine rendering of a crenellated rim as found on a bowl from England or Ireland which also can be dated c1790-1810. D = 8.9″ (22.5 cm), H = 3.8″ (8.6 cm). Sold for $172 at an eBay auction in 2005 (Image: Internet). In all of these examples the U-notch is present, by definition. This characteristic, believed to have been derived from the rim-style of monteiths, is fully discussed in Hawkes and His U-Notch. The term castellated might be reserved for rims that strongly suggest the parapets (battlements) on a fortified castle. It has been defined as “an alternatingly high and low parapet at the top of a wall” (OED). 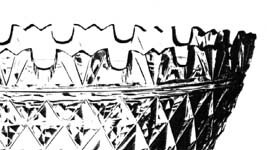 In American cut glass, however, the equivalent term is dentil rim or edge because this form is similar to a row of teeth. 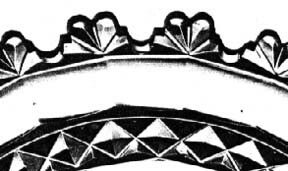 The dentil rim was used by several American manufacturers. 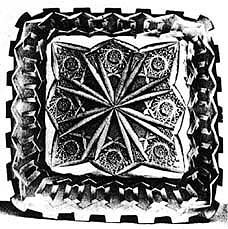 It is primarily associated with the Meriden Cut Glass Company (a subsidiary of the International Silver Company) because it was usually used on items cut in that company’s patented Alhambra pattern (1911). The example of the Alhambra pattern on the left, below, is taken from an auction ad (Image: Internet). It only hints at the brilliance of the geometric cutting that is part of this pattern. The small, square plate or tray on the right is from the company’s catalog (published, at least in part, in Pearson 1969, pp. 16-18). The image completely lacks the brilliance of the actual item, one of which was found by the writer several years ago but which was sold before a photograph could be taken (note 1). The final pair of images in this file show drawings that accompanied patent applications. The drawing on the left represents Meriden’s Alhambra pattern. On the right there is a rim that can be thought of as either a modification of the dental rim or a modification of the trefoil rim. This drawing was submitted by T. B. Clark & Company when the company sought to patent its Prima Donna pattern in 1909. 1. 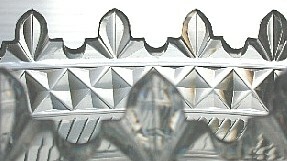 When the Alhambra pattern is found “in the field” it frequently has a chipped rim. If the chipping is severe it may be necessary to have extensive restoration undertaken. The word “necessary” is used advisedly. Alhambra is an expensive pattern and a seller often believes that he or she must present an item that is in so-called “mint” condition in order to jusify the high price asked. But the buyer must also assume a degree of responsibility for this situation. If the buyer did not insist on “mint” condition, then restoration — especially the extensive restoration discussed here — would not be undertaken. An item in the Alhambra pattern that has a badly damaged “tooth” will require that all teeth be removed, and the dentil rim entirely re-cut. 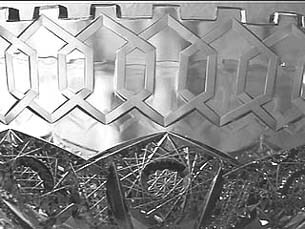 This is usually possible only if the engraved “Greek key” motif is also removed (“polished out”) and re-engraved. At least one restorer of American brilliant cut glass specializes in this kind of work, and the results that the writer has seen have been outstanding. It is hoped, however, that the seller of such an item advises any buyer that restoration work has been carried out. 1. The scene — a typical farm auction, with equipment and household effects on the block, in eastern Connecticut on a pleasant September day in 1983. The glassware consists of a rag-bag assortment, with a single blown-glass candlestick the star attraction. (It is said to be of late eighteenth century origin, and probably English, although there is a murmur of “Stiegel” among the on-lookers. It sells for a high price.) Luckily for the writer the Alhambra plate, unexpectedly present, receives little notice from anyone, including the auctioneer. It sells for $80, to be re-sold later that year for $425. 7″ (17.8 cm) on a side, H = 1.5″ (3.8 cm), wt = 2.0 lb (0.9 kg).